Online retailer About Curves Plus Sized Lingerie is awarding badges to honor blogs whose content truly embodies their belief in self-acceptance. It’s one thing to like the way you look—it takes courage and confidence to shout it to the world! “It’s one thing to like the way you look—it takes courage and confidence to shout it to the world,” says KC Culver, co-founder of About Curves Plus Size Lingerie. To reward the courageous individuals that inspire everyone to love their bodies, online retailer About Curves Plus Sized Lingerie is awarding badges to blogs whose writers have inspired us to view ourselves with pride. The online plus sized lingerie retailer was founded upon the principles of self-acceptance and loving your body, and reflects these values through the care and consideration put into making beautiful lingerie available to everyone. A quick look at their inventory will reveal stylish plus sized lingerie worn by real plus sized models. However, About Curves’ ideals resonate beyond the shopping experience and awarding badges to inspirational bloggers is not About Curves' first effort to promote self-acceptance. On October 19, 2011 About Curves celebrated Love Your Body Day by providing 25% off all purchases. A few months earlier, About Curves kicked off an annual Lingerie Loves Your Curves size-acceptance and self-esteem blogging and charity campaign, with proceeds going to the National Association to Advance Fat Acceptance (NAAFA). The campaign encouraged bloggers to share their own real life experiences and views, all in the name of self-acceptance and awareness. In fact the campaign was so successful, that it became clear that bloggers should be rewarded for sharing their stories and inspiring their readers to love their bodies. 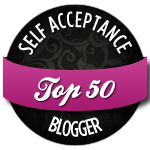 After reading many blogs About Curves chose to honor the “Top 50 Self-Acceptance Bloggers” and awarded them with their own badge to proudly display on their blog. The company’s founders hope that these badges will encourage more people to share their stories and experiences, and spread the message of self-esteem and self-acceptance to everyone. About Curves was started in 2001 by mother-daughter duo Robin Bryan Culver and KC Culver, who were looking to create a new lingerie shopping experience for plus sized women. Their frustration with the lack of options for women who did not fit the “mold” inspired them to create lines of lingerie that celebrate a woman’s beauty, no matter their size or shape. The plus size lingerie offered by About Curves is designed to not only be flattering, but also stylish and comfortable. Their dedication to making women love their bodies extends far beyond their product line and is evident in their involvement within the plus sized community.